Enjoy special Anniversary Prices when you fly to Japan with Singapore Airlines, ANA and JAPAN AIRLINES. 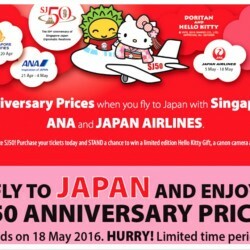 Fly to Japan and help celebrate SJ50 (50th Anniversary of Singapore-Japan Diplomatic Relations)! Purchase your tickets today and STAND a chance to win a limited edition Hello Kitty Gift, a canon camera and Free hotel stay. T&Cs apply.